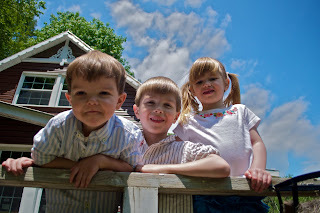 Creating a Simple, Godly Life while homeschooling 4 children eight years and younger. Deuteronomy 6:7 "And thou shalt teach them diligently unto thy children, and shalt talk of them when thou sittest in thine house, and when thou walkest by the way, and when thou liest down, and when thou risest up." I have decided this year and every year at Thanksgiving, I am going to make a list of the 50 things I am thankful for. We all have so much to be thankful and it helps to list them out so we don't forget the many good things in our lives. loves and forgives AND FORGETS. What an amazing God I serve. 2. A loving husband that is there for me in every way I need and could ever have asked for. He has blessed me in more ways than I can express. Thank you honey! amazes me how my love has grown with each one. should treat a woman and take care of his family. provides our needs to have food everyday. work for. We can complain about it at times but all in all it is an awesome job and I am thankful. So many do not have jobs right now. deeper, wonderful relationship with God. firemen, rescue teams, I am thankful for them all. that he would have a great teacher that I could trust and know she would teach him great things. God truly blessed by giving him my favorite teacher from elementary school. eternal life with Him in heaven. 21. Holy Spirit helping me through each and every day. 23. Having hot water/ indoor plumbing. 24. To have clothing on my back and on my children's'. 25. To be able to stay at home with my children. experience every time they learn something new, and that is a huge blessing to me. have no idea how much you mean to me and have helped me throughout the years. 31. SLEEEP...when I get it! happy thing for me to do. and make me a better mom and wife. now. It has taught me so much but most of all has brought me closer to God and His greatness. a budget and stick to it! If you have not taken his class, I highly recommend it. everyday that I did not know and amazes me every moment. 41. Clean water and that with just a lift of the faucet I can have it. 42. COFFEE! My favs being Pumpkin Spice Latte and Raspberry Howler. you all post on your own blogs. It truly brightens my day. of the house twice a month for some wonderful girl talk. incidents he has already been through in his 3 years of life. 48. My wonderful and wacky Wacko, who has more energy than he knows what to do with. He is a constant comedian, lover boy, and rotten to the core. without and stress to do so. everlasting life with my Father in heaven and many family members who have passed. I had no idea your blog was up and running again- yay! Alyssa is a happily married, homeschooling mom of 4. Boys-8 and 5yr, Girls- 6yrs and 20months. I am a born again Christian and Thank God for where I am today. Our God is an AWESOME God and I wouldn't be where I am without him.